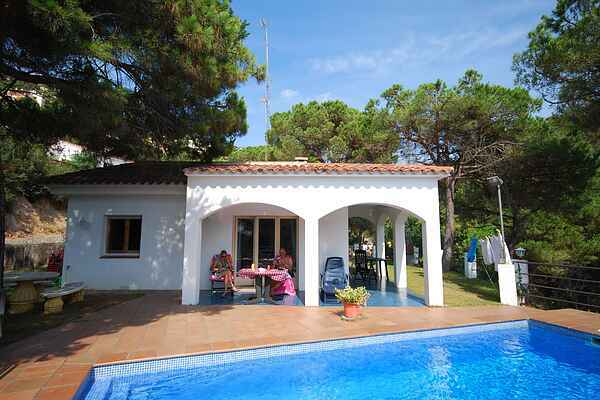 Beautifully secluded in amongst the gentle green of the area, Villa Senals peeps out from the hills of Lloret de Mar. What you'll notice about this place is its wonderful sense of privacy. You'll have your own large private swimming pool with a partly covered terrace and sun loungers. The pool is right next to the villa. So you can keep an eye on the kids from within the cool shade of the villa. And in the evening, it's a great place to read or relax after dinner. There is a supermarket 2 km away. Eat (there's a stone BBQ at your disposal), drink, laze, swim and enjoy, but don't forget the fabulous surrounding area. The picturesque bay of Playa de Canyelles (2 km) has a great restaurant. They excel at serving fish fresh from the sea accompanied by delicious wine. Why not knock a ball around at the nearby tennis court (2 km)? The hardy explorer will enjoy historic Tossa de Mar (13 km), with its narrow, winding streets, shops and elegant, restored castle. Lloret de Mar (4 km) also has a great deal to offer; shops, cafes, a reputation for international cuisine. There's something for everyone, along with quaint tapas bars to stimulate the tastebuds.